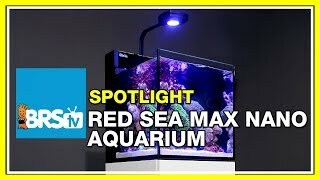 From lighting, filtration, and stunning looks the Red Sea MAX NANO all in one aquarium series has a great recipe for success allowing you to have your own piece of the ocean right in your living room. It has been a long time coming for a company to come out with such an inclusive all in one system like the Red Sea Max Nano. From ultra clear glass, proven filtration components and awesome lighting you probably won't be able to find a better tank and stand value package out there. 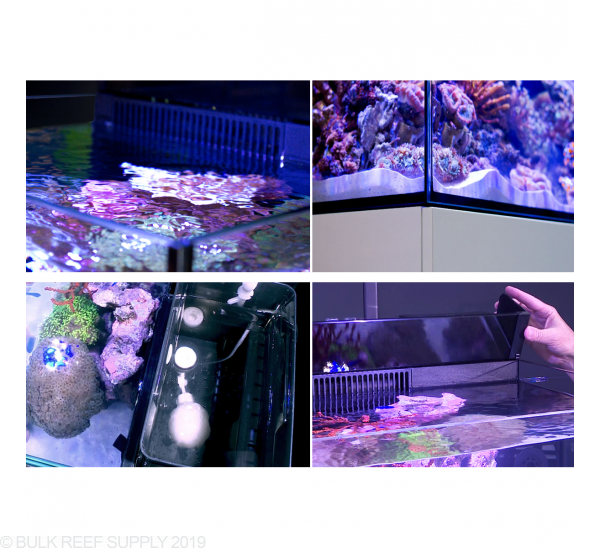 Red Sea is constantly innovating and keeping up with current technology in the aquarium market, and reef keeping hobby. The MAX Nano all in one tanks now include LED lighting along with a full filtration system, along with circulation and return pumps. The ultra clear glass lets you see your fish and corals true colors in a sophisticated rimless design that will instantly bring life and elegance to any room. Red Sea Max Nano tanks now include the most advanced lights on the market letting the Nano series be one of the most efficient kits on the market. A single Prime HD unit has up to 55w of total power available with full control letting you fine tune the spectrum and intensity. Controlling the Prime HD light is very simple through any smart phone, PC or Mac computer. With the built-in WiFi you can connect directly to the light making programming super quick and easy, or through the cloud interface letting you control your tanks light from anywhere in the world (with internet access). Max Nano has an integrated power switch box that circulation pumps the protein skimmer can be connected to for easy on/off control making them a true all in one aquarium system. 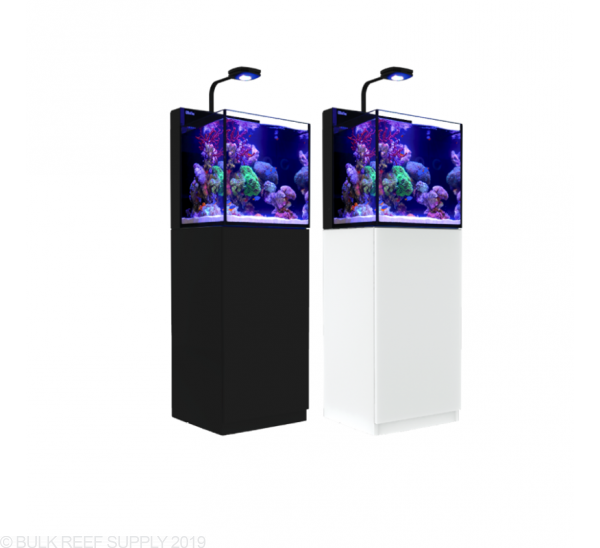 Every MAX tank comes with a stand made for saltwater aquariums with marine-spec laminate cabinet, weatherproof epoxy painted doors, push open latches, and soft close stainless steel hinges. Stands are available in two exterior colors (black or white) where the interior will be black on both stand color options allowing for a cleaner overall appearance over time. Standard glass can "wash" out colors because of a small percentage of iron in all glass making it have a slight yellowing appearance. 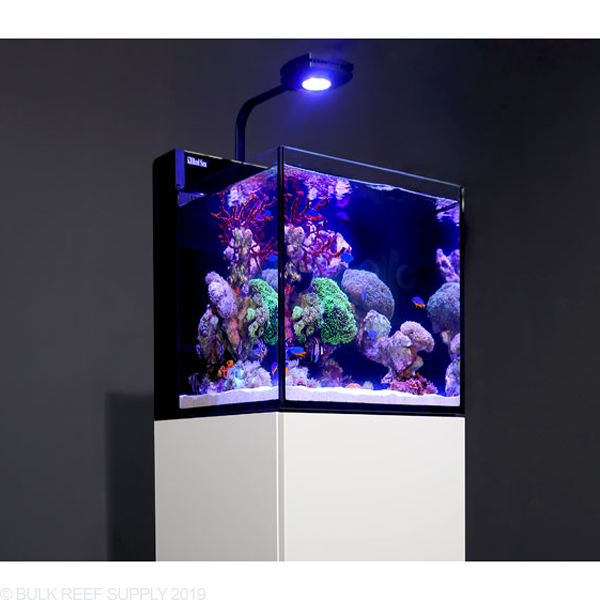 Red Sea uses an Ultra Clear beveled edge glass that has a low iron content allowing you to see the true color of your fish and coral without having any color distortion. The 8mm thick front glass lets Red Sea produce a rimless tank without the need for any ugly bracing. 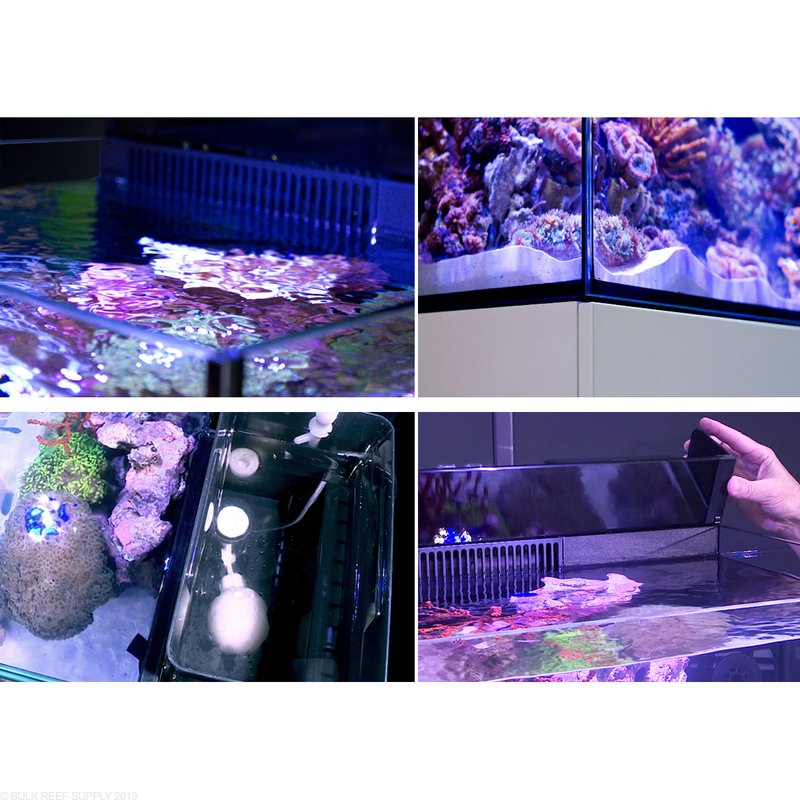 Proven Multi-stage filtration lets you keep even the most delicate corals and fish. The included return and circulation pumps are secretly hidden in the filtration compartment keeping the display portion looking clean and elegant. Along with the Reef-Spec Nano skimmer, media towers, extra space for additional filters and provisions to add a chiller too. RS Nano skimmers have a 3:1 water to air ratio creating the perfect skimming conditions within the body of the skimmer. With the advanced design of the protein skimmer, it will not be affected by water fluctuations due to evaporation and has an adjustable outlet gate creating the perfect skimmate consistency for the water conditions. I have had this system dump a gallon of water on my floor overnight 3 separate times. The skimmer can get out of sorts and starts the domino effect of leaking. Needs to be redesigned unless you like doing water changes this way. It is also hard to achieve silent operation at times. I also own a red sea 450 which I love, so this was a letdown. Ok guys I am writing this for you since there was no info on this when I looked. I ordered this tank from BRS and it has to come from the factory, they don't stock them. This means you should receive your order within 10-14 days. This order was was shipped to an area about an hour from my house and it arrived on a Sunday. I called them because I wanted to get this tank asap as most people are. When asked how soon they could deliver, they said not till Wed so I went to get it myself. Just thought this was relevant. So, now the good stuff. I look at the packing and it is excellent and I couldn't have done it better myself for myself. Thumbs up Red Sea! So, I cut off all the packing and inspected the glass first of course, again perfect and was SO happy. All the rest of the equipment was there, boxed of perfectly packed. I pull everything out of boxes, inspected plastics and pumps and no issues. The Tank- Glass was nice, no scratches and really clear. I do not believe this is Starphire glass. Only 3 sides are glass, the back is black plastic which is the front side sump. Absolutely LOVE the rimless cube open tank look. I have had over 10 tanks and this is by far the coolest looking. The Sump- This sump includes a built in skimmer and pump, return pump and auto top off. I again was impressed by Red Seas build quality of all included. Skimmer works great when tested, took me about 4-5 days to figure out the air intake knob setting. I was thinking about upgrading until I saw this and will just keep it. The ATO works great, only lasts about a day and a half. I keep my tank at 78. I have read people complaining that the ATO only lasts a day. Just fill your tank up higher if you leave for a few days! Usually its about an inch below the rim. I tried it and it lasted 3 days. If you are not at home much, think of a bigger ATO such as Tunzes. The Stand- was impressed by the high quality of the stand material. It is heavy and coated nicely. Took about about an hour and a half but i was by myself. Opens and closes nicely, plenty of room underneath for all of your stuff. Best stand quality I have seen. AI Lights- I love the aesthetics of this light and bracket, super clean. I never had LED lights on a tank before so these really look incredible to me. The app is easy to use and you have TONS of settings to chose from. Fully controllable from phone and connected to your network. Sound of Tank- The tank is completely silent, the return pump (540 gph) is great however if going to grow corals you should add a small powerhead or two for extra flow. I added an Ecotech MP-10 which is controlled wirelessly and has a battery back up which is suggested. Overall thoughts- At this moment, 2 weeks in I am totally in love with this tank. It brings any room to life and will become the main focus point for all who enter. The reason I bought this tank was because of the simplicity of the All in One concept, its all done for you. I know it's pricey, however in MY opinion, it's well worth it. I seriously love this tank. Im on week 3 of my cycle and I couldnt be happier. The tank was easy to set up, even for a newbie like me. Red Sea as a company is amazing and has excellent customer service. 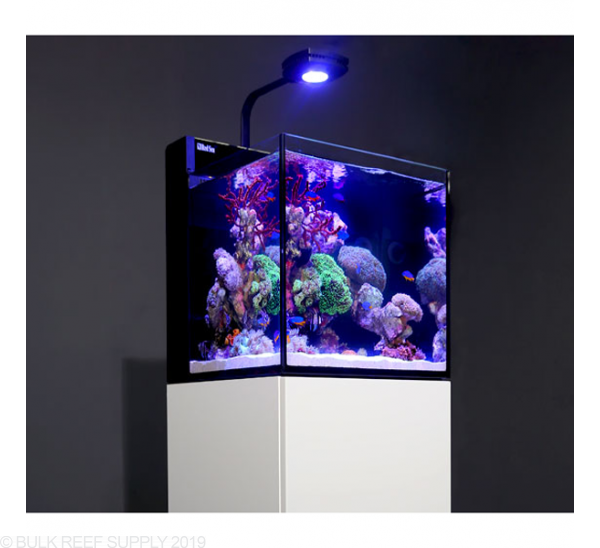 I have been a bulk reef supply viewer for years I've watched tons of youtube videos my uncle and father are hobbiest I'm looking to start my own tank at a cheap price and the reef store I usually go to recommends Red Sea products as one of the best I believe in quality and you get what you pay for. My question is what comes included with the tank? Pumps? Lights? Sump setup? Skimmer? Heater? Temp Gauge? Salinity Tester? Algae Magnet? Return Pump? Thank you and I hopefully wish to purchase this tank! Where do you put the heater?